Enjoy the relaxed and comfortable lifestyle offered by this fabulous 4 BR, 4 Bath townhouse located in Pacifico, Playa Del Coco's best place to live. This modern, well appointed townhouse is tastefully decorated. The property's high-end furnishings are in excellent condition, and are included in the sale. Townhouse 103 has a spacious, fully equipped kitchen with quality Whirlpool appliances. Large granite counter tops provide more than adequate prep space in your kitchen. The dining area features a custom table made from much sought after Guanacaste wood. Actually there is rich Guanacaste furniture throughout the house. This townhouse has three floors,On the ground floor is an enclosed 1.5 car garage, bedroom #1 and a laundry room w/full size washer and dryer, plus large enclosed storage area under the stairs. A spacious master bedroom and bedroom #2 are on the 2nd floor. The living room, kitchen, dining area and bedroom #4 are on the top floor. All bedrooms have an ensuite full size bathroom and ceiling fans. The top two floors both have private balconies with views of beautiful green areas. Pacifico's location in Coco is biking or walking distance to grocery stores, restaurants, pharmacies, banks and shopping plazas. A taxi will cost you 2 dollars max to get anywhere in town. Coco has over 50 restaurants, 3 large grocery stores, 4 banks, multiple shopping plazas, six pharmacies and an English speaking medical facility. The international airport in Liberia is 30 minutes from Pacifico. The town of Liberia, Costa Rica's third largest city, is 40 minutes away. There is a CIMA Hospital, a modern medical facility with an emergency room 20 minutes from Pacifico.Pacifico's central location, beautiful landscaping, staffed gym, tennis courts, bilingual management team and beautiful swimming pools make it a wonderful place to live. Guanacaste's luxury properties usually fall into one of three categories: a) Beachfront properties b) ocean view properties or c) properties with highly developed common areas and that are, usually, walking distance to a variety of restaurants, shopping plazas and nightlife. Pacifico is in the latter group. Playas del Coco is a fast growing beach town. Most of these businesses are walking distance from Pacifico. The beach itself is a 10 minute walk. 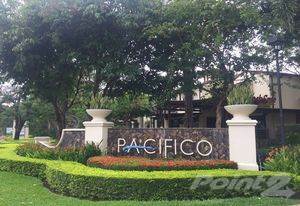 Despite being close to the "action", Pacifico is set back from high traffic areas, and provides residents a very quiet and relaxing environment. For owners and guests who enjoy sun bathing on the beach, Pacifico operates a beach club and restaurant on Coco Beach. A free shuttle service runs between Pacifico and the beach club. Pacifico is close to four beautiful and very different beaches.Coco Beach is a 10 minute walk from Pacifico and features a boardwalk, with lots of visitors and numerous inexpensive food carts. Many diving, fishing and sailing tours launch from Coco Beach. Ocotal Beach is 10 minute drive from Pacifico. Ocotal is known for its black sand and excellent snorkeling. Hermosa Beach, the area's largest beach, is a 15 minute drive away. Hermosa Beach is a great beach to sun bathe and people watch. Hermosa also has quite a few restaurants,Panama Beach is 20 minutes drive from Pacifico. Panama Beach offers good swimming and has two popular restaurants. Public parking is available at each of the above beaches. Arrecifes #14 - Rare opportunity to buy in this complex! Hi, I'd like to find out more information about Pacifico. Thanks so much!